I started off the BBQ season with this recipe for Grilled Coconut Lime Chicken Skewers. It led to a lengthy discussion in our house about whether they should be called Kebob’s (shish-kebob) or skewers. A “sis” (shish) is a Turkish word for sword and a kebab is usually small pieces of marinated meats on a skewer. Depending on the country or area the recipe originates usually determines if there are vegetables on the skewer. Grilling foods for entertaining is an easy method that usually requires little clean-up as you’ve done all of your cooking on the grill. These Grilled Coconut Lime Skewers are marinated ahead of time so all you have to do when your guests arrive is throw them on the grill and serve. You can’t beat that for low maintenance entertaining. I usually marinate these the night before making them so the flavors of coconut, lime and ginger have plenty of time to seep into the chicken. 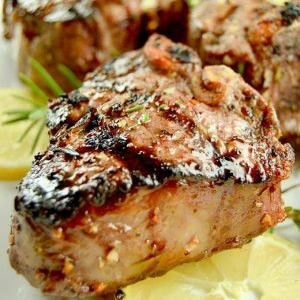 While the flavors may seem very strong when you put them in the bag to marinate, they are very subtle when they are done grilling. 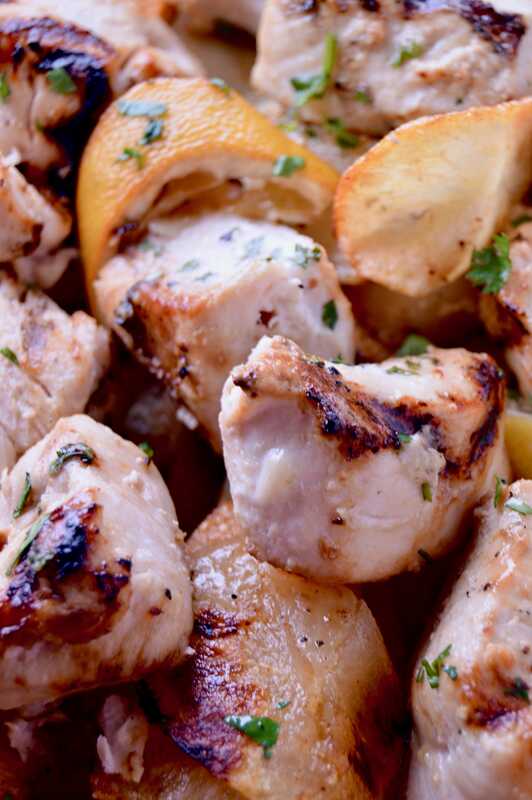 I served these Grilled Coconut Lime Chicken Kebobs over Grilled Lemon Potato slices. (I’ll be posting that recipe soon 🙂 ) It would work equally as well over a crisp salad or even something as simple as rice! If you need a sauce to go over it you could make a chimichurri recipe like I have here. Easy/Hard. Very Easy. 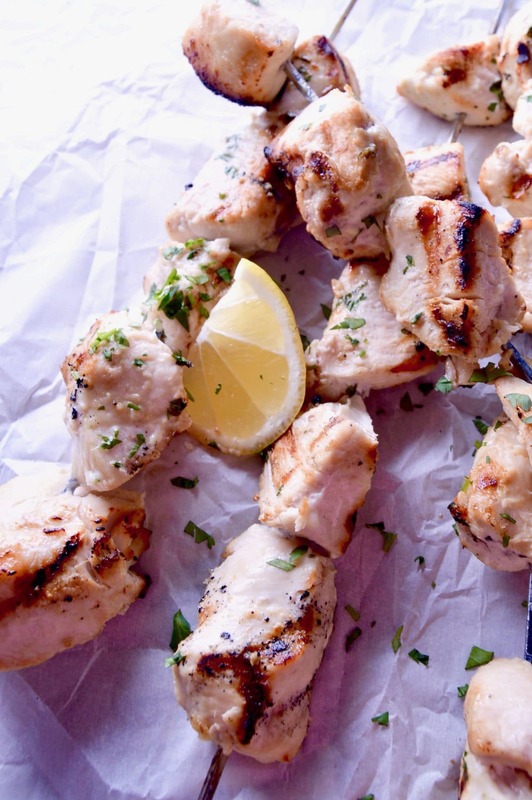 Marinate overnight, cut chicken to even pieces and grill when ready. 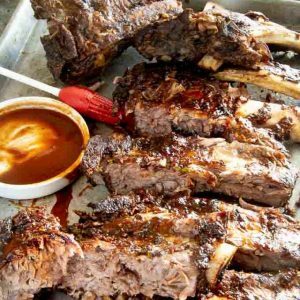 Make Ahead: You can marinate ahead of time so you don’t have to be away from your guests while cooking except when its on the BBQ. And honestly, everyone usually gathers round the grill when its cooking to smell all the wonderful aromas so even then you won’t be abandoning your guests! 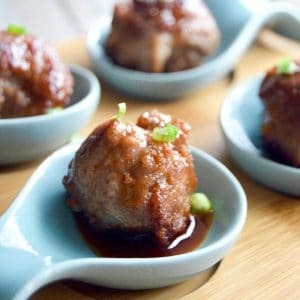 Serving options: You can make these for the main meal or do really small wooden skewers with smaller bites of chicken to serve as an appetizer. Serve with Rice, potatoes or over a salad if its for the main course! Pairing: The coconut and lime lend themselves to something tropical…. like a Mai Tai here. 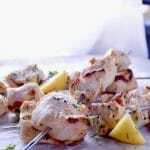 Grilled Coconut Lime Chicken skewer recipe that can be marinated early in the day and popped on the grill when company arrived. 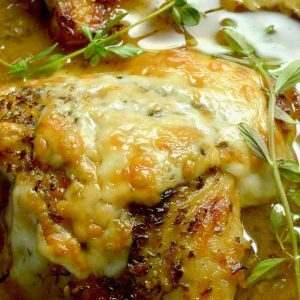 Lightly scented with coconut, lime and ginger this moist tender chicken is a tasty bite. Cut Chicken into bite sized pieces, making sure they are all evenly cut. When grilling on a skewer it is VERY important to have the chicken all be the same size to ensure even cooking of all chicken. Into a large ziplock back add the chicken, lime zest, lime juice, coconut milk, ginger, garlic, fish sauce and brown sugar. Seal bag bag with as little air in bag as possible. Mix to make sure all ingredients are combined. Place bag in fridge to marinate for at least 3 hours. 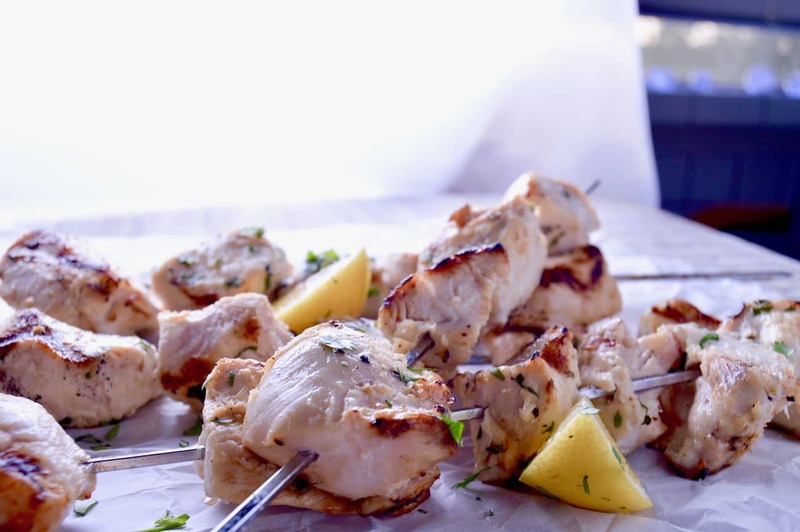 If using wooden skewers, be sure and soak them in water for an hour before threading the chicken onto them. This will prevent them from disintegrating on the flaming grill. Remove chicken from Marinade, throwing away any excess. You don't need to dry off the chicken, just gently shaking the marinade excess away is good enough. Brush or wipe with a paper towel your grill grates with oil. Alternatively you can use a spray oil, but be sure to do this with out the grill turned on to avoid being burned. Doing this helps the chicken not stick to the grill. Once grates are treated, preheat grill to hot and flaming. Once grill is hot, place skewers on the grill with ample room in between each skewer to allow for even cooking (at least 3 inches in between. You will grill for about 5 -8 minutes per side turning once. If you have a particular hot area, watch them carefully. Some smoky charring in great for flavor, but you don't want them to burn completely. When grilling, do not leave the grill unattended. Flare-ups are common and you want to have even temperature cooking the entire time so you may need to move the skewers while cooking. Once chicken is cooked, allow to rest for 5 minutes before trying to remove from the skewer. This will allow juices to settle back into the meat and allow the skewer to cool slightly before having to touch it. Despite the fact that I’m usually a little obsessed with the language of food, I’d never really thought about what shish kebob means (or, for that matter, what constitutes a shish kebob). I’m glad to know now! Love the flavours you’ve used here. I don’t use coconut enough in the kitchen, and when I do it tends to be for South and Southeast Asian cooking. The combination here seems perfect for the grill and for a hot summer day. Nice work! I’m so excited that grilling season is here! It’s such a convenient way to cook during the summer, and the flavor can’t be beat. We got a new grill this year, so I’m hoarding recipes like you wouldn’t believe! 🙂 Absolutely love the flavors in your marinade, and your suggestion to pair the grilled skewers with a Mai Tai! This sounds so tasty – Love all these flavors! Somehow I’ve gone through life without making kabobs. I know I’ve eaten then at cookouts, but I don’t think I’ve ever taken a ‘stab’ (lol) at it myself! I’ll have to give it a try!! Ooooh I love chicken grilled up like this. Coconut and lime is a great combo! perfect for summer! These look tangy and delicious! I really like the subtle flavor that the marinade adds. It’s very good over rice!